The centerpiece of every Grace Hopper Celebration is the closing-night dance party. This year, the hotel ballroom twinkled with the light of a million LEDs flashing on Google-branded eyeglasses. The floor bowed alarmingly with the beat. Strangers smiled at each other across the sea of bouncing women. Some of us cried. We were together and we were ourselves. I attended the conference and its boisterous finale this year without friends or colleagues. I’d planned to bop awkwardly along the edges of the dance floor for a few minutes and then get a good night’s sleep. Instead, I met a remarkable series of women who gave me inspiration and hope, who left me buzzing with energy and ideas. It was much better than a good night’s sleep. When I first arrived to the ballroom, the dancing hadn’t started. It was swag time (t-shirts, the blinking eyeglasses, and glow sticks) and meal time (sliders, meatballs, and lentil salad). I nibbled my way around the room until dinner felt accomplished. I watched, standing alone, as the dancing started. The floor went from empty, to full, to packed, to overflowing, in less than ten minutes. The music was pounding. The room was twinkling. Still alone, I started to reflect on the conference’s messages of inclusion and empowerment, and the symbolism of the dancing mob of female technologists. It was visceral and overwhelming. I’d had some wine. I started to tear up. I swiveled toward the exit, because a crying mother of three does not improve a dance party no matter how cute her outfit is. As I turned, I saw Telle Whitney walking three feet from me. Telle is a co-founder of the Grace Hopper Celebration, the newly-former CEO of AnitaB.org, and a highly visible and recognizable face at the conference. She is the soul of Grace Hopper, and she was alone. In another venue I wouldn’t have dared, but in this particular time and place it felt right. I ambushed her. “Telle, hi! You don’t know me, but I wanted to say thank you for all you’ve done: This year’s celebration, the past celebrations…all of it. Thank you.” We hugged, and she thanked me. We were both crying openly as everyone danced around us. Through tears I choked out what I’d been thinking all night: “I had no idea how much I needed this.” We hugged again, and then I just blinked awkwardly at her. She was gracious enough to ask if I wanted a picture. I did, and in it I look exactly like you’d expect for that moment. I hope Telle was gratitude-bombed by a hundred women like me that night. 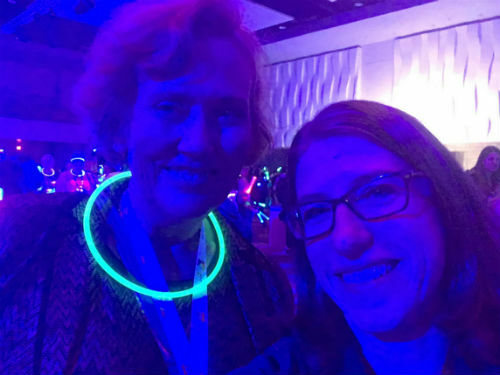 Telle Whitney being a model of grace with me at the Grace Hopper dance party. Tears flowing, I headed for the exit. I was nearly there when a young woman locked eyes with me and yelled, “Hi!” Ignoring her was not an option. I didn’t know her, or her companions, but they turned out to be as warm and engaging as you’d expect three computer science undergraduates not to be. If they noticed my tears, they didn’t let on. These young women were a beautiful antidote to my heavy-heartedness. One had interviewed with several companies at the career fair that morning, and had received two internship offers on the spot. She radiated the excitement of someone who sees a universe of possibilities for her future. I was (am) excited for her. I remember feeling that way myself. My excitement persists, but it burns more slowly and less red-hot now, tempered by experience. It was energizing to watch her blaze the way I did when I was her age. These women told me about their courses and schools; I told them about my work and family. We were open with each other in a way that is unique to the environment of Grace Hopper. We traded stories of our favorite moments from the conference, and said good-night. I wish I’d gotten their contact information so I could tell them now what a difference that simple “Hi!” made in turning my evening’s trajectory from melancholy to hopeful. I want their confidence to last. I had to concede that yes, she was likely older, but also that I was a little bit jealous. How amazing to be able to share such an inspiring experience with your daughter! I asked this patient woman unending questions about how she raised her daughter, what it was like to be here together, and what it was like to watch her enter the world of tech. We wondered whether there were other mother-daughter pairs in attendance. If so, they should form a panel on this at next year’s conference. It would be fascinating to hear how mothers and daughters each perceive the experiences of the other, through the lens of a shared family experience and technical world, but from different generations. I left the ballroom at the end of the night exhausted but buzzing. My feet were nearly bleeding by the end of the walk back to my hotel, but I was smiling anyway. The party was the perfect coda to the conference: Energizing, validating, and inspiring. Before bed, I poured words into my laptop, trying as best I could to capture the evening’s energy. I don’t know the exact circumstances that will force me to dip later into my well of inspiration, but I’m thankful for what I was able to add into it: New role models, small displays of kindness and confidence, glimpses of myself in others, and the memory of thousands of technical women young and old, dancing together in a twinkly ballroom.